Taylor writes: I'm a high school student and my history teacher just told us about how the United States once called French fries "freedom fries" to spite France. Please tell me he's joking. 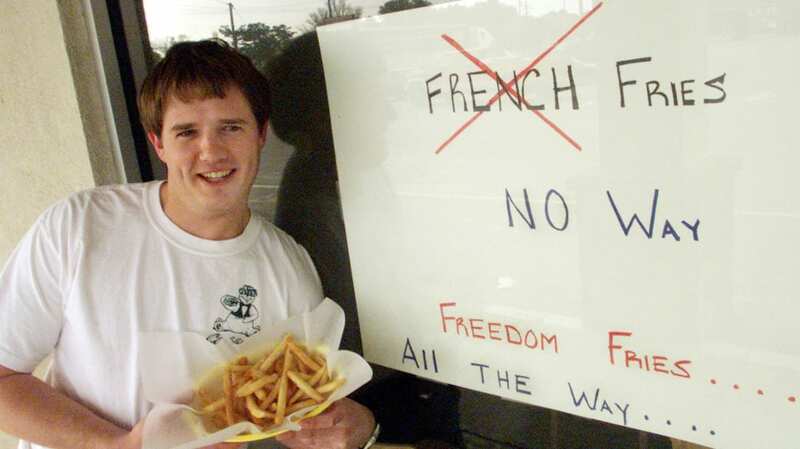 Yes, there was a time when some Americans decided to call French fries "freedom fries"—embarrassingly, a number of those people happened to be elected officials in the U.S. House of Representatives. In early 2003, the United States was in the midst of a (rather unsuccessful) attempt to drum up worldwide support for a potential war with Iraq. While cobbling together a "coalition of the willing," many historical allies of the U.S. said, "Nope." One notable dissenter was France, whose officials had been vocally opposed to the imminent conflict. "As we’ve said from the outset," French Foreign affairs Minister Dominique de Villepin said in January 2003, "we will not join in military intervention that did not have international support... We believe that military intervention would be the worst solution." By March, the course had been set. The UN couldn't find evidence of weapons of mass destruction in Iraq, but the United States made it clear that invasion was inevitable. War fever grew, and "with us or against us" found its way to the U.S. House of Representatives cafeteria. Rep. Bob Ney, an Ohio Republican who was chairman of the House Administration Committee and therefore in charge of operations for the Capitol complex, ordered that the word "French" be removed from all affiliated menus. French fries would become "freedom fries," French toast "freedom toast." According to the New York Times, "The action was unilateral." "This action today is a small, but symbolic effort to show the strong displeasure of many on Capitol Hill with the actions of our so-called ally, France," Rep. Ney said at the time. The idea for the change came from North Carolina Representative Walter B. Jones, who was inspired by Cubbie's, a restaurant in his home state that had earned a little bit of press after deciding to rename their fries. Jones passed the suggestion on to Rep. Ney, who instituted the change. When reached for a statement by the Times, a French Embassy spokeswoman said, ''I wonder if it's worth a comment. Honestly. We are working these days on very, very serious issues of war and peace, life or death. We are not working on potatoes.'' She also noted that French fries are, in fact, Belgian. This wasn't the first wartime name-switch in U.S. history. In the late '50s, the Cincinnati Reds became the "Redlegs" in light of the McCarthy era and the Red Scare. During WWI, German measles were dubbed "Liberty Measles." Neal Rowland, the owner of Cubbie's, said his decision to update the menu was inspired after learning about some of these decades-old name-switches. He is pictured above, outside of Cubbie's. According to Yelp, his Beaufort, N.C. eatery no longer exists. Rep. Bob Ney resigned from Congress in 2006 for his role in the Jack Abramoff corruption scandal. (Ney was eventually sentenced to 30 months in jail.) Upon leaving his post as chairman of the House Administration Committee, all the menus in the Capitol and connected buildings were changed, and French fries were finally served again.